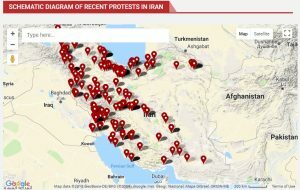 Reports from MEK’s network, shows, labor protests made up a large percentage of total protests in April. Workers protested for many reasons, including lack of employment, dismissals, failure of employers to pay wages, job uncertainty, and recruitment of non-partisan forces. Protests by looted people took place in 13 cities across Iran in April. Women played a large part in these protests. Protesters closed buildings and looted businesses, throwing garbage and rotten eggs and fruit at the businesses that looted their financial accounts. Retirees protested in two cities in Iran this April. They protested the retirement age, lack of benefits and matching funds for retirees, and the inability to achieve the required years of service in order to retire. MEK network also reports that Iranian teachers gathered in five different cities to protest the withholding of their salaries for months and sometimes up to a year. A number of teachers resigned en masse in response to rumors that Director General of Education was going to be dismissed. And teachers protested for the release of Mohammad Habibi, a teacher who was detained by the regime. After a series of protests for his freedom, the regime bowed to pressure and released him. University students held protests in eight cities across Iran in April. They had a variety of concerns, including the firing of a professor, more possible firings of faculty, poor food quality on campuses, mismanagement and corruption by university officials, and poor wages and employment status. Students also protested in support of striking businessmen and marketers in Kurdistan. 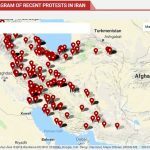 Another 245 protests reported by MEK sources in Iran in 73 cities did not fit into any of the above categories. The protesters and their causes were varied and diverse. There were protests against closing border crossings and increasing tariffs. Kurdish businessmen and marketers protested an offensive characterization by state media. Farmers protested against poor economic conditions. Farmers and many other citizens protested unfair water rights and lack of access to water. The number of protests grew from March to April as the widespread uprising against the ruling regime continues. May is on pace to surpass the April protests.